EURUSD is chiefly under the influence of the French Election for EUR and Trump’s tax cut announcement for USD. 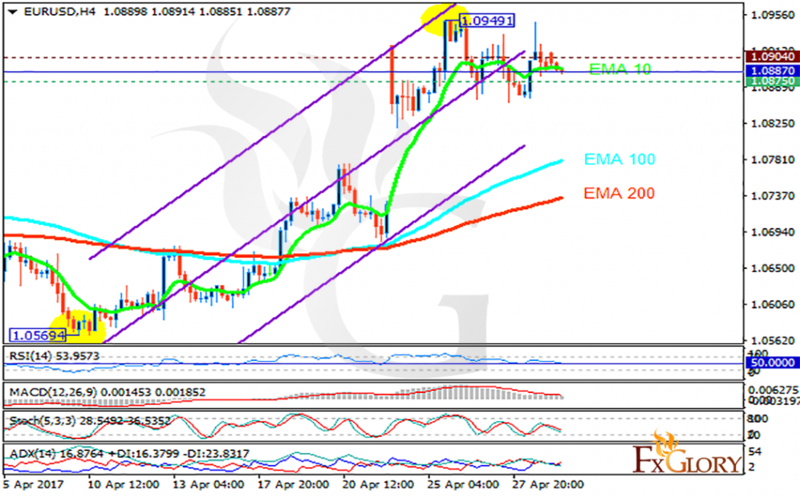 The support rests at 1.08750 with resistance at 1.09040 which the weekly pivot point at 1.08870 is located in between the lines. The EMA of 10 is moving horizontally above the EMA of 100 and the EMA of 200. The RSI is falling towards the 50 level, the Stochastic is showing downward momentum and the MACD indicator is in positive territory. The ADX is showing weak sell signals. Bullish trend is the most probable scenario targeting 1.095 while pullbacks are not out of the picture.